A common problem when creating a Lotus Notes view is designing a column that categorizes documents by month (or quarter). Many Lotus Notes developers have reinvented this wheel many times over, with varying degrees of success. In this tip, SearchDomino.com contributor Chuck Connell attempts to solve this problem once and for all. A common problem when creating a Lotus Notes view is designing a column that categorizes documents by month (or quarter). Categorizing by individual date is simple -- you just change a plain date column into a categorized column. But categorizing by month can be a pain. Many Lotus Notes developers have reinvented this wheel many times over, with varying degrees of success. My hope with this tip is to solve this problem once and for all, and I invite readers to re-use my downloadable solution. The key problem is that months are numbers, which you usually convert to text to create a readable column. Unfortunately, when you sort the resulting text column, the months appear in the wrong order. For example, if you convert the month numbers 11 and 4 to text you get "11" and "4." When Lotus Notes sorts these values, "11" appears before "4." Obviously this is incorrect, since November actually comes after April. Another approach is to convert the month numbers to month names, so 3 becomes "March" and 4 becomes "April." But displaying this column also gives the wrong answer, since April appears before March when it should appear after. The solution is to use a hidden sort column that "fixes" the sort order, and then create a readable column that shows the months as you want them to appear. You may want to download the sample and examine the view named View1 as I describe it. The first column in the Lotus Notes view is a standard counting/totaling column, so that the view shows the number of documents in each month category. You can remove this column from your version if you do not want this feature. The second column contains the code "@Year (Date1)*20 + @Month(Date1)" and is a hidden column. The reason for multiplying the year number by 20 is to establish a correct overall sorting order for all year and month combinations. The trick causes November 2003 to be assigned a sort order before January 2004, as you want. Lines 1 and 2 in the above code assign a readable name to each month number. Line 3 creates the content of the displayed view column. Even though the text in this column does not sort in the correct date order, this does not matter, because the hidden second column has put the documents in the right order. To translate this example to another language, simply change the month names in Line 1 above. Notice that the code uses the square-bracket syntax to pick out list elements. Because of this, the code will not work on Lotus Notes versions prior to ND6, when this feature was introduced. If you find a way to improve this design, or have a simpler alternative, or find any bugs(! ), please let me know. About the author: Chuck Connell is president of CHC-3 Consulting, which helps organizations with all aspects of Lotus Notes and Domino. The leading zero helps to correctly sort the single digit months. @Round( ( @Month( @Created ) / 3 ) + 0.49 ). This will return a 1, 2, 3 or 4. So now the view is categorized by year (optional) and month. This formula adjusts whatever the DateTime value is to only be a date, and always be set to the same day -- the first day, but also keeps the month and year. Once you've trimmed off the time and the day is seen as the same value in the column, let Lotus Notes do the work. Set the column style to be "Date/Time." Change the display to be "Custom" and turn off the "Time" display. Set "Show" to be "Only month and year" or "Month only," depending on what you want to see. Set "Month" to be either "mmm," for three letter month abbreviations, or "mmmm" for the month's full name. Now, change the date separators to whatever you want (I usually just delete them) -- after that, you're done. 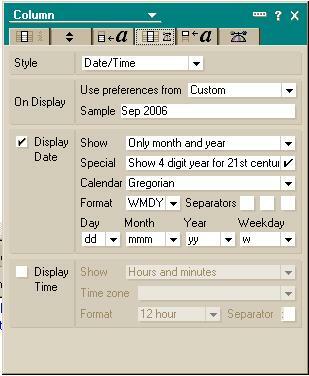 Lotus Notes is still working with a DateTime value, so it handles the sorting properly, and then conveniently converts the month so you don't have to. I also created a quick sample database. If you want to check it out, it's at http://www.malcolm.hostetler.com/notes/tcalsort.nsf. For many of my views collecting measurements, I use this method for sorting by year, quarter and month. I do it all in the same view. This view shows completed requests by year, quarter and month for measurement purposes. Here's another variation of the categorized by month tip and a consolidation of some of the earlier comments with a twist or two added. You need only to replace "DocActivity_timeOpened" in the first statement and "DocActivity_timeOpened" inside the @If statement with your own date/time fields. Similarly, change the values relating to quarter numbers so that they correspond with each other. Because these are in different calendar years, I have to adjust the month so that January displays after December. Please let others know how useful this tip is via the rating scale below. Do you have a useful Lotus Notes, Domino, Workplace or WebSphere tip or code snippet to share? Submit it to our tip contest and you could win a prize. Thank you so much for this post. I always struggle with dates in Lotus Notes and this time I was not able to display a date field categorized and sorted. Thanks for all the great code.